Beautiful, thick ,Ceramic frying pan. PTFE and PFOA Free for healthier cooking. 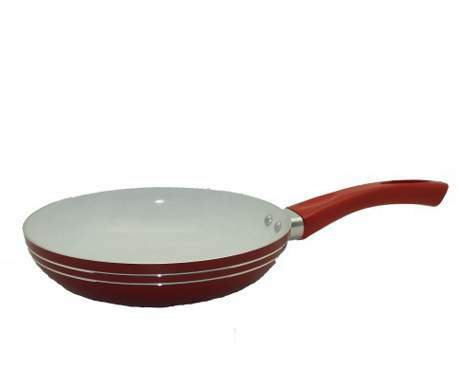 Advanced Non – Stick coating to makes your food slip out of your pan. 2.5 mm thick gauge ceramic distributes the heat evenly and efficiently to cook your food evenly and efficiently without burns. 26 cm size is good enough for all your day to day needs. Heat resistant Bakelite handles stays cool for touch. Long lasting reverted handle architecture for a comfortable grip. Stainless steel rim holds the shape better. It will prevent the cookware from denting. It also prevents you from cutting. Granite finished outside is durable. Specially designed bottom of this pan captures and distributes heat evenly. It is specially designed to work on induction cookers, in addition to the normal gas ranges and electric ranges.